Welcome to the second half of SVRG’s amazing 2016 season. All of our skaters have been working hard both on and off the track, and it shows. The Dot.Kamikazes, SVRG’s nationally recognized travel team, has been climbing up through the WFTDA rankings all year. This month in our SVRG Family Spotlight we take pleasure in introducing one of our favorite & fiercest players: Hot Saracha. In addition to being part of the SVRG skater training team, this season Saracha has also been voted Captain of the Dot.Kamikazes. SVRG: Thanks for taking the time to help highlight the awesome work you ladies have been doing this season. How long have you been skating with SVRG? 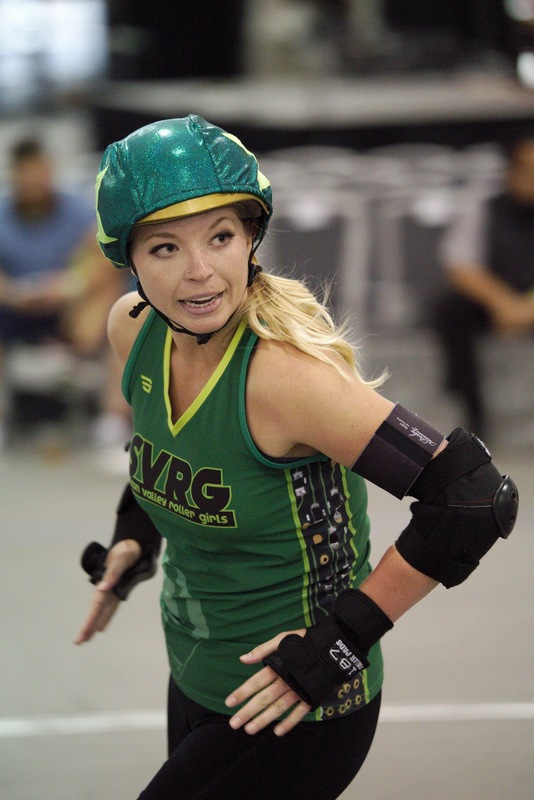 Saracha: I passed my minimum skills after boot camp in March 2013 and have been with SVRG ever since. How long have you been rostered with the Dot.Kamikazes? The very first Dots game that I was rostered for was against the Santa Cruz Derby Girls in September 2013. That game was terrifying to say the least. 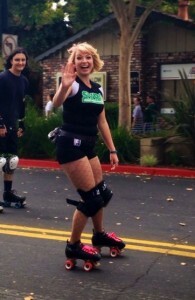 There is proof… one of SCDG’s beloved veteran (now retired) skaters beautifully racked me and another SVRG skater. It has been an exciting, and challenging, 3 years skating with the Dots. The Dots have always been a very competitive team, but this year has seen so much growth both for players & in the WFTDA rankings. What do you feel is different about this year? The training committee has done an excellent job of revamping the practice structure and ultimately the way the Dots play as a unit. The building blocks and cohesive drills shared by all skill level skaters is allowing each team to achieve their competitive goals. Derby is a constant evolution of new techniques and strategies - keeping up with current game play is half the battle. We are working hard to climb back up in rankings. Who has been your favorite team to play against this year, so far? 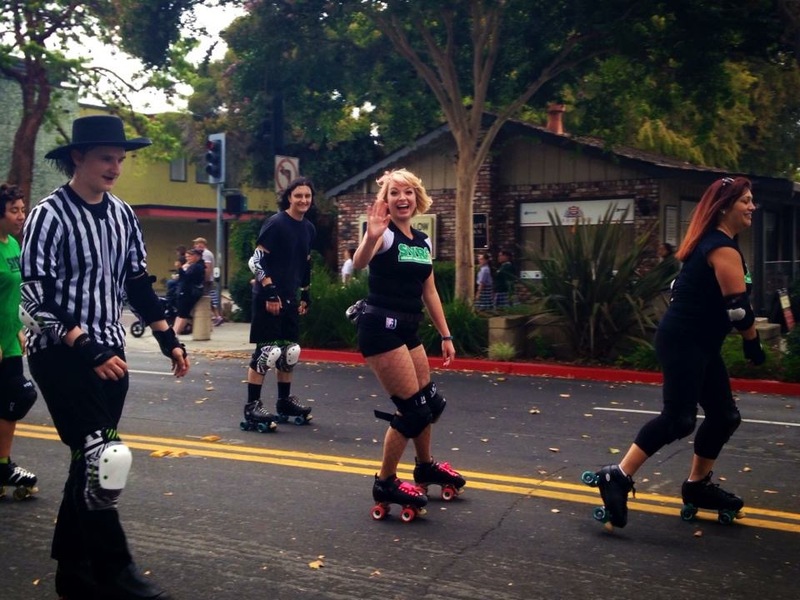 My favorite league that we’ve played this season would have to be the Monterey Bay Derby Dames. I love their strong blockers and quick jammers. We love when their skaters join us at our black and white scrimmages. Playing against those lovely ladies is always exciting. What were some highlights for you from the game you played against Monterey? The best part, as a jammer, is breaking through their strong walls. The best part, as a blocker, is holding onto their jukey jammers. Executing successful offense with my team is always a highlight. Saracha watches the track during a recent home game with the Dots. What has been your most challenging moment in a bout so far this season? The most challenging moment I’ve had this season was track coaching a game against the Sac City Rollers. It’s hard to be off skates on injury and feel helpful to your teammates. Giving my team the support they needed on the track was very challenging when communicating from a distance and not in the pack. I was very proud of SVRG for fighting their way to victory that night. What is the best part of playing with the Dot.Kamikazes? My favorite part of playing with the Dots is being able to skate with all of my talented teammates. There are few lucky people in the world that get to experience a bond such as the one created by playing derby. We all play for the love of of the sport. I cherish the individual energy every person brings to the game. Nothing compares to that! As team Captain & a member of training, what do you feel is driving the team this year to achieve their successes? The desire among the league to get better, increase rankings, trust each other, be stronger, win games, and stick together is allowing us to succeed this season. As Captain and a member of training, we are channeling each of our peers to achieve their personal and team goals. It’s been a true pleasure to be captain of the Dots this season. I have been honored and respected by all of my teammates in my role as a leader. Being the Dots Captain has many responsibilities that have only made me a better skater and teammate. It means a lot to me to have the trust of my team on and off the track. This season has allowed me to grow more than any other season has before. From coaching boot campers to competing in WFTDA sanctioned games, the experiences that I have gained throughout this season will stay with me forever. The Dots are going up against the Faultline Derby Devils this month. What is the team doing to prepare for this game? We are working on our pack strength and smart strategy. We don’t want to give away our secrets, ha ha, but our efforts will speak for themselves. So fast, so pretty.